Mobility Scooters - Do I need insurance? It is not a legal requirement to have insurance for a mobility scooter, but from a common sense point of view it is highly advisable, especially for the more powerful Class 3 scooters that we supply. The most important thing about insurance is to have third party liability cover, you see nowadays, if you were to catch someone’s ankle as you were driving, the first instinct that a lot of people have is to call a “Blame Claim” lawyer. It is you as the rider of the scooter that is personally liable for any damages. If you research this subject on the internet, you will find lots of horror stories about people losing their homes over this. Therefore, at Mobility Nation we feel that insurance is so important that we give three months free with every mobility scooter we sell. If you have any questions regarding this topic, please give us a call on 02476 713 913. We will be more than happy to help. claims which you may have seen with the myriad of TV and radio advertisements. (run by Mark Bates Insurance Ltd). cover and vary upwards according to the risks that you wish to cover. Exclusions: Be aware of common exclusion clauses that some of these policies have. do well to check your policy, or to clarify it directly with your insurance company. take your scooter abroad with you, check the small print first. have to reclaim the fare from your insurance company. If in doubt, ask. moth or 3 months free) so that you are covered from the minute you buy the scooter. Others may offer such deals as “Buy 12 months, get cover for 15”. Do I really need a mobility scooter? For most people buying a mobility scooter can seem like a daunting prospect especially if it’s their first scooter. A sensible question to ask yourself before you start your search is “Do I really need a scooter?” Nowadays there are lots of ways to retain your mobility without having to resort to the expense of buying and maintaining a mobility scooter. Most modern town centres have Shop Mobility schemes in place and as long you provide enough notice there are generally scooters available to loan for free. Likewise, most supermarkets have a limited number of scooters for use whilst shopping, and you would be hard pressed to find a tourist resort that would not rent out a scooter for the duration of your holiday – for a fee of course. What sort of scooter do I want? Once you have decided that a scooter really is for you, the next step is to narrow down the type of scooter that you need. Important considerations are whether you need a small compact mobility scooter that splits apart to go in the boot of car (known as Boot Scooters) or a scooter that is capable or being ridden on the road (known as class 3 scooters). Class 3 scooters have a maximum speed of up to 8MPH but can only travel at up to 4MPH on pavements under UK law. Other key points to consider are whether the scooter is capable of carrying your weight and whether or not the scooter will be capable of the range that you expect to travel. If a boot scooter is required, ensure that you have the opportunity to test that it will fit into the actual boot that will transport it. 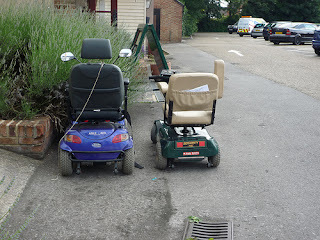 Lastly, a lot of people decide that a mobility scooter is required because of declining health. Ensure that your health has not deteriorated to such a degree that may hinder the safe operation of your scooter. Trade In: If you already have a scooter that you need to sell, it is hard to beat the convenience of being able to Trade In your old scooter against the price of a new one. Often though, the price that a dealer may offer you in part exchange will be less than could be achieved by selling yourself privately. Some unscrupulous dealers have been known to create a very high purchase price for the new scooter so that they can offer a generous part exchange trade in price so that customer thinks they are getting a good deal when in reality, the price was too high in the first place. Ensure that the dealer that you visit actually displays prices to avoid any “confusion”! Range: Most dealers have a range of models to choose from, enabling you to find out the model that is most suitable for you. Once again, it is very convenient to be able to compare different models back to back in the store. Don’t be pressurised into buying straight away – take your time & compare the price and service that different dealers offer. Negotiate: If two dealers sell the same scooter, ask if one is prepared to beat the other on price. If you ask in a friendly non-confrontational way, then most dealers will be prepared to negotiate in order to keep your valuable custom. If you don’t ask, you don’t get! Guarantee: One of the main advantages of buying new from a dealer is the piece of mind that dealer back up offers. As a minimum you can expect a 12 month parts and labour warranty, but further options may be available like service plans & warranty / insurance schemes. Check on line: Of course, there are other ways of buying a new scooter apart from through a dealer. If you are able to identify the exact make and model of scooter that you are after, please do check on line to see if there are significant savings to be made. A good starting point would be to look on Ebay or Amazon or even to search on Google within your local area (eg: “Mobility scooters for sale in Birmingham”). Online prices will often beat buying from your local scooter shop because they do not have the overheads of a high street location. Reliability: Buying a new scooter means that you will be the first owner and can reasonably expect 3 to 5 years reliable service from your machine, provided that it is serviced and maintained in accordance with the manufacturer’s recommendations. If you buy a second hand model, how can you be sure that the previous owner hasn’t abused it? Price: The main benefit of buying second hand versus new is the difference in price. A mint condition 6 month old scooter would typically sell for half to two thirds of the price of a new one. People’s circumstances change as life moves on – there could be a death in the family – health deteriorates – health improves. All of these events can lead to a mobility scooter becoming surplus to requirements allowing for a genuine bargain to be had. Resale value: If you are smart in your choice of used mobility scooter, it may be possible to use it for a while & resell it for the same as or more than you paid for it. You will certainly lose a lot less financially if you buy and sell a second hand scooter compared to a brand new one. 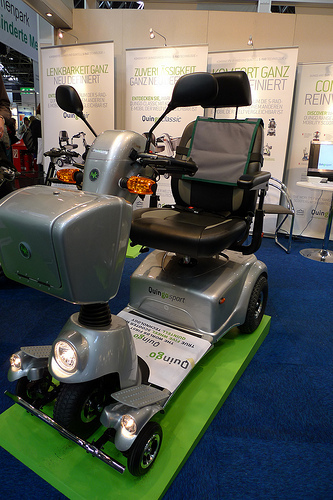 Cost effective: Some customers may only need the use of a mobility scooter for a short period of time, for example while they are recovering from an operation or embarking on a long vacation abroad. Once again buying and selling a used scooter should prove to be the most cost effective solution overall – especially when compared to renting a scooter abroad. Where to buy used: Most mobility scooter dealers will stock a range of used mobility scooters that have been taken on part exchange against new models. Buying a used scooter from a dealer has the advantage of backup and servicing availability but customers will pay a premium for this. For a more cost effective way to buy used, you could try looking in your local newspaper, on notice boards in supermarkets & newsagents also online at Ebay, Gumtree & Preloved. Bargains can be had if sellers are not net savvy and have to resort to notice boards! Check the price: Just because a scooter is being sold as used does not mean that it is a bargain. Check what the new price is with local dealers and on line (as above) and make sure that the difference in price makes buying used worthwhile. General condition: Obvious as it sounds, check the general condition of the bodywork, does it look as if it has been abused or has it been cosseted in cotton wool by a loving owner? Are there any tears in the seat? Tyres: Check the condition of the tyres, do they have much tread left? The front two tyres are generally the ones that suffer the most with regard to wear as they steer the scooter. Just like a car, if the tracking is out it can cause premature wear on tyres. Wheel bearings: Check for play in the wheel bearings by tipping the scooter slightly on it’s side and moving the bottom of each wheel. If there is any sideways movement then that could be an indicator of worn wheel bearings. Scooter Frame: Whilst the scooter is tipped, have a quick look at the underside. This area can suffer from corrosion and changing the framework can be prohibitively expensive. Test Ride: Don’t be afraid to ask the seller of it is ok to take it for a quick spin. You wouldn’t buy a car without driving it would you? Things to look out for are how it handles bumps and corners. Are there any excessive vibrations, squeaks or rattles? Batteries: One of the most expensive parts on any mobility scooter is the batteries. In order to test the batteries, they have to be “worked” which means putting them under load. The best way to do this is to head for a steep hill or slope when out on the test drive. When riding up the slope check that the battery condition meter doesn’t drop excessively. Some voltage drop is normal, but no more than approximately 20 percent. Be wary of customers that say the scooter has “hardly been used”. Does “hardly been used” mean “hardly been charged”? One of the worst things that people can do to a mobility scooter is to leave it without charging the batteries. All scooter batteries like to be charged regularly, if not then batteries “Sulphate up” and lose all of their capacity to hold charge. Accessories: Check that that the sale includes the Charger and Manual and ask if there are any receipts available for things like servicing or parts. You never know, those expensive batteries may have only just been replaced and may still be in warranty. Is there is any warranty left on the scooter from the manufacturer or dealer? If so, ask if it is transferable. Parts availability: If the scooter that you are looking at is a particularly old model, check that parts are still available for it. There is nothing worse than finding later on that the scooter has an annoying fault that can be rectified by changing a cheap component only to find that it is no longer available to buy. Haggle: Ask the seller why they are selling the scooter. Be wary of sellers that say that they are selling on behalf of someone else. If you do find any areas of concern, remember to take that into account before deciding whether or not to make an offer. Once you have made the decision that you want the scooter, remember to haggle politely. A good question to ask is “How flexible are you with the asking price?” This question strikes the right balance and prepares the seller for negotiation. Never pay the full asking price. A good starting point for haggling would be 75 to 80 percent of the asking price. If the asking price is close to a large round number (such as £429 or £520) it is reasonable to assume that the seller would be prepared to drop that amount so ensure that your first offer is lower than that amount. You can always increase your offer, but it is extremely to reduce your offer once you have agreed the sale. Enjoy the haggling process. A lot of people find this a very uncomfortable part of buying, but if you relax with it you stand more of a chance of enjoying yourself & having a fruitful outcome. What’s the worst that can happen? You simply buy elsewhere! Insurance: Once you have bought your scooter, do consider insurance. Nowadays if you have an accident where you bump into someone the first thing that they tend to do is pick up the phone and call a “Blame Claim” lawyer. You are personally liable for any accident or damage that you cause whilst riding your scooter. The important part of the insurance is “Public Liability Insurance” This covers you in the event of a claim such as this and policies start from as little as £79. This is especially important if you buy one of the road legal Class 3 scooters as they are larger and more powerful so the damage that they can cause is significantly more. Puncture Prevention Sealant: If your scooter has pneumatic tyres, do consider investing in a sealant system. This is added into the tyres and can protect against punctures in objects up to 6mm in diameter. Tax Disc: If you buy a Class 3 scooter don’t forget that you need to apply for a free tax disc from the DVLA. The full process of how to do this is detailed in form INF211 available on line or from all main post offices. Mobile phone: Do carry a mobile phone with you at all times when you ride your mobility scooter, especially when riding it for the first time. If you do have cause to breakdown whilst out and about at least you will have a convenient means of calling someone to assist you or calling for a black cab to get you and your scooter home. Mobility Scooters - Do your prices include VAT? Most or the mobility scooters we supply are exempt from VAT. However, a form is provided for this, so in most cases the price you see is the price you pay. You just need to fill in and sign the enclosed form and return it to us in the reply paid envelope stating the reason that you need a mobility scooter (something like arthritis, COPD etc…).